We do our best to get at least one “learning adventure” in a week. This past week, we managed to get two of them in. Monday, we went to Tech Dome Penang, an (amazing) interactive science centre. Friday, we learned about Batik painting through taking a class and visiting a Batik Painting Museum. It was a week with a perfect balance of art and science. We stumbled across Tech Dome Penang a few weeks ago in Georgetown. Our family has visited a fair number of science centres over the years, and we have to say – Tech Dome Penang was incredibly well done. The centre is housed within a geodesic dome, in the top floor of the mall at the Komtar building. The staff at the Tech Dome were delightful, and it was clear that they all love science and love helping people learn about it. We ALL engaged in the activities here. This is Marcus learning about gravity. Because we went on a school day, the Tech Dome was fairly quiet so we had time to indulge in playing with the exhibits as much as we wanted to. Apparently, during school holidays – the place is packed. 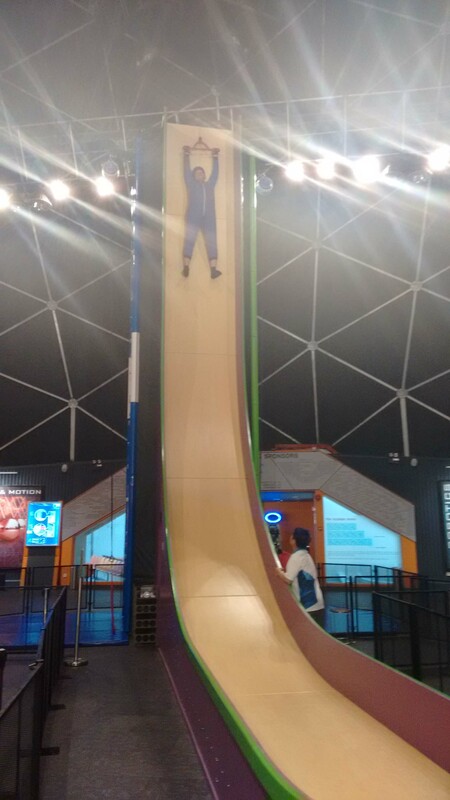 Our family spent three hours at the Tech Dome, enjoying interactive exhibits that teach about the Material, Physical, Living and Mechanical world. A family pass for a day here costs 110 Ringgit (about $34 CDN). It was worth every penny, and we look forward to visiting again another day. In Batik painting, wax is applied to fabric (so that dye will “resist” those areas) in designs, and then dye is painted onto the fabric. It is an art form that is unique to Malaysia, and we had the pleasure of taking a class in Georgetown where we got to try painting on “pre-waxed” designs ourselves. The class took an hour, and our (lovely, patient) teacher walked us through using the dyes and how to create different effects. We have all missed painting since we have been on the road. It was a wonderful experience to have brushes in our hands again. The one hour class costs 35 Ringgit per person (about $10.75 CDN). We were very happy with our final paintings that we got to take home. A three minute walk away from Rozana’s, is the Batik Painting Museum. After our class, we walked there to take a tour to see the works of a number of different artists. This is a fairly new art form, which started to emerge in the 1950’s in Penang, and subsequently spread to other areas (i.e. Singapore, Kuala Lumpur). There is a wide range of different styles that the medium can accommodate. The museum does a good job of showing many different examples of the art form. The museum is spread out over three floors, and takes about 30-60 minutes to go through. There are benches for those who enjoy sitting and getting lost in a painting too. Admission to the museum is 10 Ringgit (just over $3 CDN) for an adult, and 5 Ringgit for a student. We found the combination of the class and the museum to be a great introduction to this unique art form. Fantastic art work…love the post! Very interesting. Good luck on your trip.